We have to admit, it’s a little disrespectful to write about one of the great African-American athletes of the 20th century right around the time when the self-proclaimed “Greatest” Muhammad Ali passes away – but why we’re writing anyway about Race, which tells the incredible story of Olympic track runner Jesse Owens, is because his is a tale worth putting amongst the likes of the late boxing champion, even though the film itself doesn’t entirely do it justice. It’s 1933, and young Jesse Owens (Stephen James) arrives at college ready to run track, for which he has a serious talent that is soon noticed by coach Lawrence Snyder (Jason Sudeikis). Soon, Owens is competing in and winning at several events nationwide, eventually earning a chance to compete at the 1936 Berlin Olympics – which, given the rise of the Nazi regime and Adolf Hitler’s vision for Aryan athletic supremacy, makes things more than a little complicated for a man who is already receiving racial discrimination in his own country. In a not-so-subtle twist, the title Race has a double-meaning; aside from showing Owens’ most known achievement at said Olympics where – spoiler alert if you’re not caught up with your sporting history – he ended up winning four gold medals in a tremendous achievement, the film wants to focus just as much on Owens’ overcoming of harsh racism from both his own turf and eventually the Third Reich itself. It’s a noble attempt by director Stephen Hopkins, who also did the much better biopic The Life and Death of Peter Sellers, to show how it wasn’t easy for anyone with dark skin to live in a pro-segregation America, not even someone who would eventually go on to win Olympic gold for their country, but it’s handled in a way that feels very standard, as though they’re aware of the weight of the situation but are perhaps a bit too afraid to really say anything unique or noteworthy about it. The closest we get to this actually working here is when the discriminatory practices of both 1930s America and Nazi Germany are compared back-to-back in scenes of dialogue, but even then it’s very minor and not entirely developed for it to really stick. There have been much stronger scripts that have dived a bit further into the concept of racism in contemporary America and left more of an impact, like Guess Who’s Coming To Dinner and The Help, but Race relies on too many conventions of the sports genre for its own tackling of the subject to even leave a mark. That’s honestly where the film ultimately falls flattest, ironic for a film about a talented track runner; because the script leans a little too heavily on tricks and beats we’ve seen dozens of times over in sports movies, and especially biographical sports movies, everything else it tries to do with a noble heart ends up getting lost in the mix. We have, in the context of this script, the wide-eyed and determined young athlete who’s taken under the wing of a cynical but warm-hearted coach who, through a brief series of training montages, makes him a bona fide athlete who ends up winning over the hostile crowd who are soon cheering once he starts winning event after event. It’s very standard, not a lot of it is done that’s new, and anyone who’s sick of seeing this clichéd plot over and over again in these types of movies will most likely be distracted by how lame it is handled here as well, no matter how good the intentions were. You also end up feeling every second of its 134-minute running time, because even if you don’t know the real-life outcome you already know how it’s going to end because you’ve seen it all before, and you’re counting down the moments until the next recognisable plot beat shows up instead of actually caring about what’s really going on. Not helping is that there are many parts of this film, sometimes even entire characters, that could have been cut out entirely and it wouldn’t have made any less of an impact – a whole subplot of Owens embarking on a brief affair with another woman, to the ire of his girlfriend and mother of his daughter, is one of the more notable of these, as is William Hurt’s Olympic committee member who goes up against Jeremy Irons’ more prominent Avery Brundage in a vote to boycott the Berlin Olympics. Some have more of a presence than others, including Game of Thrones’ Carice van Houten as a mostly sympathetic portrayal of German filmmaker Leni Riefenstahl and David Kross as German rival-turned-ally Carl “Luz” Long, but with a cast of this size there’s bound to be some that just end up having little to no true purpose in the overall story, and the same can be said about the overstuffed story too. It’s hard to knock this film entirely, because it honestly does have some good intentions, mostly to highlight the fascinating career of Jesse Owens, who actor Stephen James brings to life in an impressive and potentially career-making performance, and the figurative hurdles he had to jump over to become the success that he was, based purely on the colour of his skin. Unfortunately, Race is just too much of a conventional sports film to leave as much an impact as Owens himself did that summer of 1936, in Nazi Germany no less. 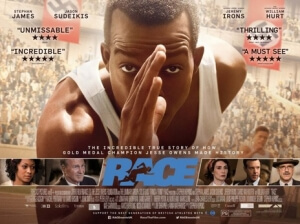 Race undoubtedly has good intentions, namely highlighting the impressive career of Olympic star Jesse Owens and the consistent struggles with racism that he endured for most of his professional life, but it’s ultimately too much of a conventional sports movie with a clichéd story and an overstuffed script that it’s unlikely to leave as big an impression as the man himself did.